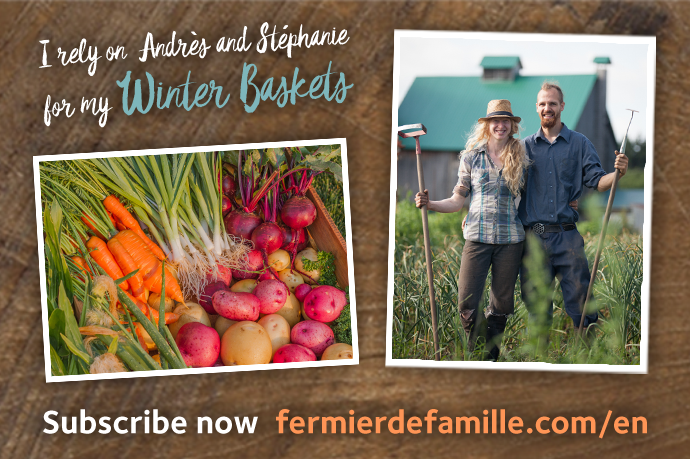 Équiterre’s family farmer network is the only one that offers local organic winter veggie baskets certified by Québec Vrai or Ecocert Canada. Sign up for an organic basket by October 23, 2017, for a chance to win a 20% discount on your subscription. You’ll eat pesticide-free vegetables all winter: the farms in the network are certified organic by Québec Vrai or Ecocert Canada. Organic baskets produce no waste or use minimal packaging. Just be sure to bring your own reusable bag! Winter baskets cost 25% less than the equivalent selection of organic vegetables in grocery stores, according to price-monitoring data for winter 2016. We ♥ better quality at a better price! Équiterre’s family farmer network generates $1.7 million a year for the local economy. You sign up directly with a farm so there’s no intermediary and you can connect with the family farmer that grew your vegetables. Quality and trust guaranteed! Food on grocery shelves has travelled on average 2,500 km, and yet there are over 29,000 farms in Quebec. So when you sign up for a basket, you’re supporting local producers. Sign up for a winter basket! Winter basket newbie? Here are some answers to Q&As to give you the basics. To sign up, go to fermierdefamille.com. When you enter your postal code, you’ll soon find a family farmer that delivers to a drop-off point near your home or workplace. Winter baskets are delivered once every two weeks, from November to February, March or April, depending on the farm. You’ll receive a wide variety of fruits and vegetables, including garlic, broccoli, squash, spinach, celeriac, cabbage, beetroot, parsnips, apples, leeks and sprouts, throughout the winter. Organic meat baskets are also available. The Bio Locaux adds more variety, too, offering other organic products, such as oil, bread, flour, meat and honey. You can trade vegetables when you pick up your basket and postpone deliveries when you’re away. If you’re not sure about signing up for a whole season, ask whether your family farmer offers trial baskets. Your family farmer will give you recipe ideas at the drop-off point. You’ll also find 20 mouth-watering comfort food recipes made with winter vegetables in our e-book (French only) featuring 20 celebrities such as Josée Di Stasio, Christian Bégin, Laure Waridel, Karim Ouellet, Josée Blanchette and Sophie Cadieux. It also contains a harvest calendar, tips for preserving fruits and vegetables for short or long-term storage and family farmer profiles.